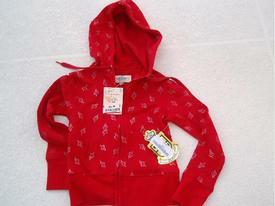 Sweatshirts with drawstrings pose strangulation risk: recall issued. Washington, DC (www.NewYorkInjuryNews.com) – The U.S Consumer Product Safety Commission (CPSC) http://www.cpsc.gov , in accordance with Liberty Apparel Company, Inc., of New York, NY, announced a voluntary recall of Jewel Girls’ Hooded Sweatshirts with drawstrings on March 24, 2010, as reported by the CPSC. The CPSC and Liberty Apparel Company recommend that consumers stop using the recalled items immediately. The sweatshirts have been made with a drawstring through the hood, which can pose a strangulation hazard to children. In February 1996, CPSC issued guidelines for the production upper garments, such as jackets and sweatshirts, in order to prevent children from getting strangled or entangled. The industry voluntarily incorporated these guidelines as standards. The recall involves approximately 2300 items. The sweatshirts are zippered, hooded tops with the style number J2184SK. The jackets come in red or white with small gold and silver hearts with arrows printed on them. The style number is printed on the tag on the inside seam. The label “Jewel” is on the neck tag. They came in sizes small, medium, large and extra large; or sizes four through 16 and were retailed for approximately $10. They could be purchased at Marshalls, Burlington Coat Factory and Rainbow Apparel from August 2007 to September 2009. Consumers are told to either remove the drawstrings immediately to eliminate the strangulation hazard or to return the garment to the place of purchase or Liberty Apparel Company for a full refund. Any additional information can be obtained by calling Liberty Apparel Company at (212) 768-3030 between 10 a.m. and 5 p.m. ET Monday through Friday. Consumers can also visit www.burlingtoncoatfactory.com for information.